“Digitalschmiede” – Opening – Vinci Energies digital lab! 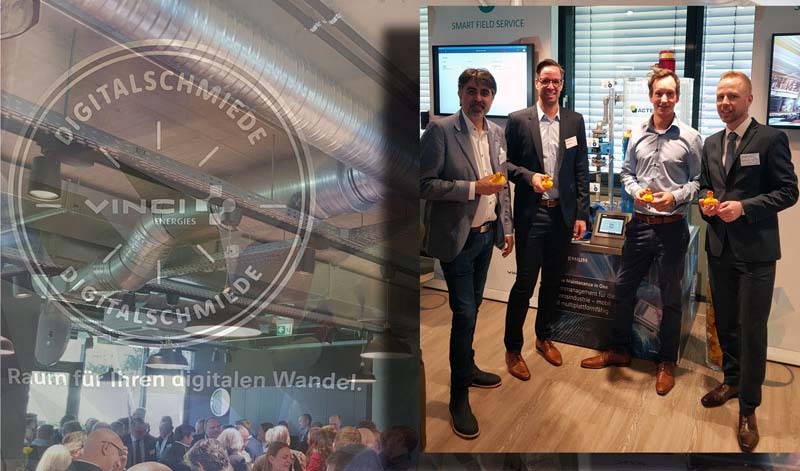 On the 6th of April, the so-called “Digitalschmiede” of our partner Vinci Energies opened its doors in Frankfurt, Germany. It combines a creative working place with a demo room for digital prototypes. In this innovative environment, own business units as well as start-ups will receive impetus for their digital projects. Among other cooperation partners, Augmensys is also part of this new and unique concept. Jürgen Kneidingerwas on site to witness the full operability of the UBIK®-based “Smart Maintenance” showcase, together with Frank Berger, Actemium, and Jorge Rivero Sanchez of Vinci Energies. After the ceremonial opening by Dr. Reinhard Schlemmer, Deputy Managing Director at Vinci Energies and a guided tour around the place with its wide variety of showcases, visitors could experiment and ask questions on their own. They were visibly impressed by the possibility of monitoring and controlling a fully working, small-scale demo plant through data glasses (Microsoft HoloLens) and a tablet. The kick-off event was a great success and certainly this space for digital change will continue to be successful in the future. We are looking forward to further exciting and innovative events! UBIK – now on iOS!